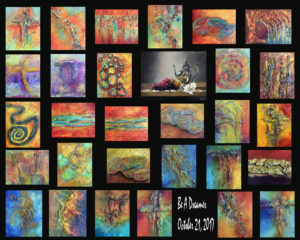 Reminiscing a bit about the wonderful 30 paintings in 30 days event held at the RandomArt Gallery in Cherokee held on October 21, 2017. The challenge was fun with some lost sleep and moments of stress, but the artwork unfolded and now it is a beautiful dream accomplished! Ugly self doubt creeps in … occasionally looking back to see a stepping stone in the rear view mirror gives a little spring to the step for getting over self doubt’s stumbling blocks. A collage of the 30/30 artwork (above) and the poem written to accompany the 30 pieces (below). May your day be filled with love, peace, joy and beautiful dreams! Be a dreamer of new and profound love. A dreamer of peace, love and happiness. Be a dreamer embracing and nurturing that which fills the heart with anticipation. A dreamer seeing endless ideas fresh with opportunity. A dreamer who when one opportunity is missed, begins seeking the next. A dreamer overflowing with optimism and energy. A dreamer growing and brightening each moment with pure joy. Be a dreamer who is willing to sit quietly with shattered and broken dreams. A dreamer looking to the next morning sun, the hope of a new day. For what is a dream, but hope. Hope when the dream is fresh with color, shape and form. And, still hope when the dream is dimmed, gray and falling apart. ← Why buy original artwork! But I’m not the only one. Rod Murrow on Why buy original artwork!